My sister and her family are in town visiting us this week! 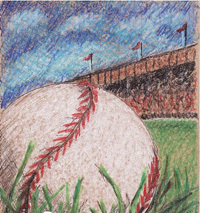 Today we are going down to Yankee Stadium for a game. My nephew is a huge Yankees fan and can’t wait to see Alex Rodriguez play! He also wants to take a picture of his number at the field. 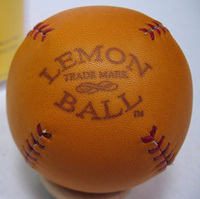 I thought today I would bring you a couple great baseball related items from Etsy. This pen & ink drawing was given to me as a birthday gift from my very talented brother-in-law! I love it so much! He drew it from looking at Margarita Bunny in my shop. I think it needs to be used as promo material for Etsy , but the original is mine and will soon be framed. 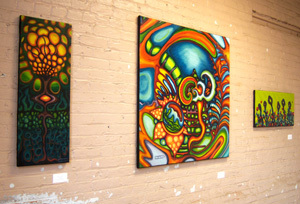 Nate had some work up in a show here in town last week. We went to the closing party this past Saturday evening. We went blueberry picking yesterday afternoon! It was one of the only things that I really wanted to do for my birthday weekend, so we did it. I still don’t know how many we picked weight wise, but it was a heavy 1/2 filled bucket. It was so nice to get out of the house and enjoy all the scenery while picking our own berries. Bean, of course went along, she had a great time! 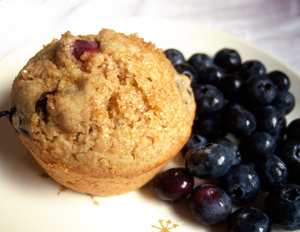 This morning I woke up early and decided to make whole wheat blueberry muffins! I used spidercamps lime sugar suggestion for a tablespoon of the sugar in the batter and also sprinkled a little of it on top before baking. Yummy! Thanks so much for stopping by. I hope you enjoy the rest of your weekend! I have been a big fan of curster for a while now, she is like the “big kid” of plush and toys that I look up to and admire. I am so very taken by one of her newest creations, goodgirl no.11 in mukluks is just adorable! 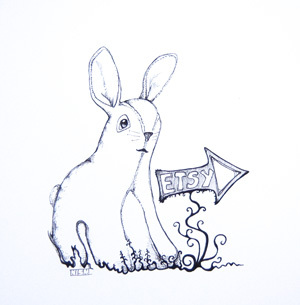 I have more items on Etsy that I would love to have. If I decided to list them all, this post would be a mile long. If I’m home later today I will try to put up a treasury of the items on my Etsy Birthday Wish List. I know we will be heading tot he farmers market later this morning. 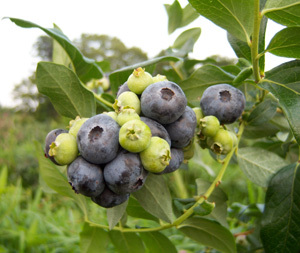 If it’s not too hot this afternoon I would love to go across the river to The Grieg Farm to pick blueberries! Oh, I almost forgot to tell you! Dad is doing so well that he got the doctors go ahead to finish the Ragbai today! Today they will be riding into Le Claire, Iowa to reach the finish line. 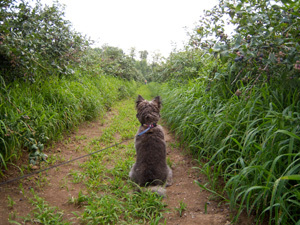 I wish I could be there to get a photo of him crossing the finish line…Gosh, I hope mom remembers to take the camera! I hope you all have a great day, thanks for stopping by! 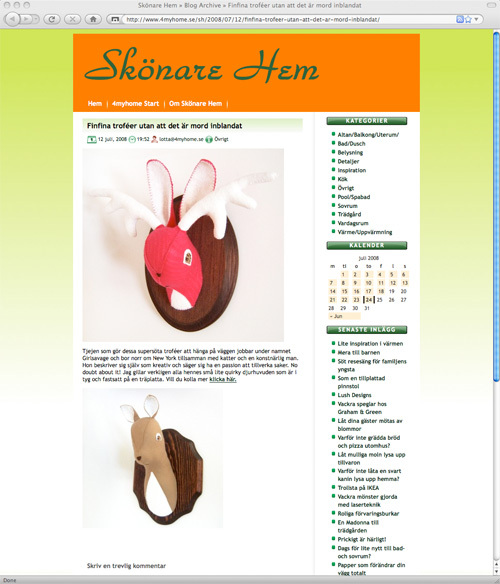 That is what was translated from a site where I found some of my Feltidermy being featured the other day! The title read: Finfina troféer utan att det är mord inblandat… and I said ” Oh my gosh, what are they saying?” With the help of a few friends and Google Translate, we found out that I was being featured on two different Swedish sites within a short time of each other. It said: Tjejen som gör dessa supersöta troféer att hänga på väggen jobbar under namnet Girlsavage och bor norr om New York tillsamman med katter och en konstnärlig man. Hon beskriver sig själv som kreativ och säger sig ha en passion att tillverka saker. No doubt about it! Jag gillar verkligen alla hennes små lite quirky djurhuvuden som är i tyg och fastsatt på en träplatta. Vill du kolla mer klicka här. Which translates to: Girls who do these supersöta trophies to hang on the wall working under the name Girlsavage and lives north of New York in common with their cats and an artistic Monday. She describes herself as creative and say they have a passion to make things. No doubt about it! I really like all her small little quirky djurhuvuden who are in cloth and fixed to a träplatta. Would you like to see more click here. 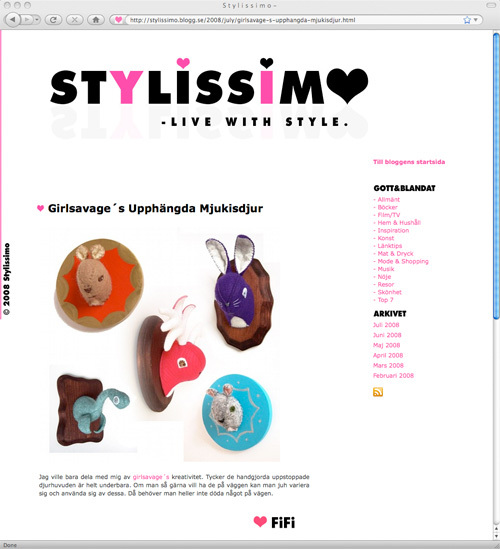 It said: Jag ville bara dela med mig av girlsavage´s kreativitet. Tycker de handgjorda uppstoppade djurhuvuden är helt underbara. Om man så gärna vill ha de på väggen kan man juh variera sig och använda sig av dessa. Då behöver man heller inte döda något på vägen. Which translates to: I just wanted to share with you girlsavage’s creativity. Does the handmade uppstoppade djurhuvuden is absolutely wonderful. 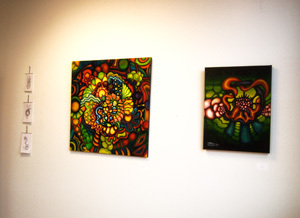 If you would like to have those on the wall, you can vary juha themselves and make use of them. Then you need not kill anything on the road. ~I’m always so flattered and excited when I find my work featured somewhere. These two were an added bit of fun because we had to translate them before being able to read them. Thank you so much to the people who have been nice enough to feature my work! How soon will you be googling your name? A few new plush and an update. I’ve added a few new plush to the shop in the past few days. 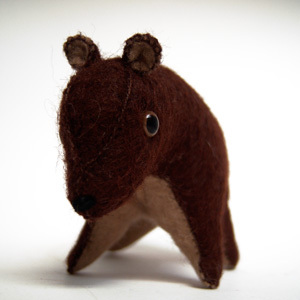 Bruno was lucky enough to get to the front page of Etsy Sunday evening, in a beautiful treasury curated by fringe! 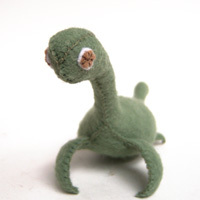 Next Ponik the Little Loch Ness Monster was added to the shop on Monday. He is the smallest loch ness monster that I have made, at 7 inches long. Isn’t he Cute!? 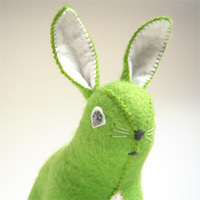 Finally, last but certainly not least I added Margarita the Plush Bunny to the shop this morning. I love her chartreuse green wool felt! The update is about Dad in the Ragbrai… Dad made it through most of the first day. That leg of the ride has many hills and the heat was up in the high 90’s. Understandably for those conditions he ended up in the hospital with heat exhaustion. I know I wouldn’t have made it as far as he did and I have to wonder how many other people are in hospitals along the Ragrai route due to heat. I truly think the Ragrai organizers should think about doing this in September or October when it is not as hot across Iowa. Dad certainly can’t say he didn’t try and can now check this one off his “Bucket List”. I’m very proud of you dad, but very happy that you are home and safe! xo! Today my post is for my Dad! I am writing this as he rides in his first leg of RAGBRAI 2008. RAGBRAI is The Des Moines Register’s Annual Great Bicycle Ride Across Iowa! It is an annual seven-day bicycle ride across the state of Iowa. The ride is the longest, largest and oldest touring bicycle ride in the world. My dad was one of hundreds of thousands of cyclists to register for the race and one of only 10,000 to have their names drawn to participate! As this week goes on I will be keeping track of where they are along the route chart. If you are in Iowa and have a chance to go watch the riders, it should be quite a site to see…. and if you wouldn’t mind, please cheer loudly for Dad Savage! 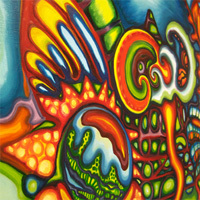 I thought this print by Katie Jeanne Reim was appropriate for this post. Way to go Dad, we are very proud of you! Have a great ride!